Events Calendar | Come Join Us! Meetings. Book club. Bingo. Bunko and who knows what else? - Monthly Meetings, listed below. Planning our fundraiser, Woman of the Year, reports on recruitment and guests. Please join our mailing list for updates on events and locations. - Speakers Series, with guest speakers addressing such issues as women's issues, charitable organizations, and many others. Our Speaker Series are open to the entire Panhellenic community. For more information see our Speakers Series page here. - Social Gatherings, such as potlucks or dinners or Happy Hours. - Philanthropic and Social Events, such as bunco, wine tasting or our annual Bingo event at Hamburger Mary's, all of which benefit women's education. Bingo will be held on March 14th, 2018 event link - EventBrite link. - Annual Woman of the Year presentation, where we recognize exceptional women. Below you will find more detail on our 2017- 2018 events. For additional information, please contact President@laapa.net. ﻿All meetings occur on the 2nd Wednesday of the month. Social gathering and pot luck appetizers start at 6:30, with our meeting beginning at 7pm. Please refer to your e-invitation for specific location details. Not receiving our evites? Please send us an email and we will be glad to add you to our invitation list. Author & Sigma Sigma Sigma Billie Letts' Where The Heart Is is our second author. February 2, 2016 is our next meeting date at the Westside Pavillion Food Court on the East Side of the Mall by Macy's. Three hour free parking. Grab some dinner and drink and join us for a discussion on an Oprah Book Selection that celebrates the reaffirming qualities of life, even when the circumstances are less than optimal. 7 p.m.
All alumnae of all NPC Groups and Alumnae Panhellenics are welcome. December 2017 - No meeting. Happy Holidays. Wednesday, March 14, 2018 7 p.m.! Get there early to get your seat! BINGO! Join us for a fun night of LEGENDARY Bingo at Hamburger Marys WEHO Wednesday, March 14, 2018 at 7pm! You don’t want to miss this event! Bring your friends for a great night of drinks, food and HILARIOUS bingo games. All proceeds support scholarships for women. Invite your friends-all are welcome! Great ​Prizes in every round​, with ​valuable grand prize! Live Auction to benefit LAAPA's scholarship fund, which provides annual scholarships to women​. Parking: Valet is available at Hamburger Mary's. Local parking also available. Uber too! 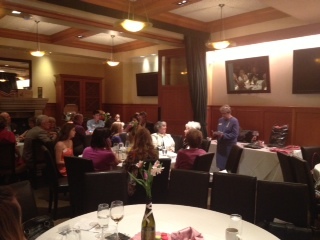 Previous years we have honored and celebrated the Woman of the Year as well as our collegiate scholarship recipients. A delightful time to socialize, indulge and support LAAPA via a silent auction which supports our scholastic awards. 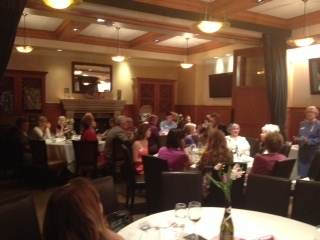 Our 2014 Benefit at Napa Valley Grill. Our 2013 Benefit at Duke's Malibu, overlooking the beautiful Pacific.